For every PHP10,000, Filipinos spend PHP8 to watch a movie, says this Rappler report. This may not look like much, but revenues generated from local and foreign movies account for 0.06% of the country’s total economic output, says the National Statistics Coordination Board. In addition, data gathered from BoxOfficeMojo shows that from a mere PHP3.984 billion in revenue in 2007, the Philippine film industry has doubled this amount in about half a decade to PHP7.064 billion last year. What do these data show? One thing for sure: Filipinos enjoy hitting the cinemas to watch the latest local or foreign clip. “Get inside, not in line!” That’s Gmovies’ mantra when it comes to watching the latest movies. 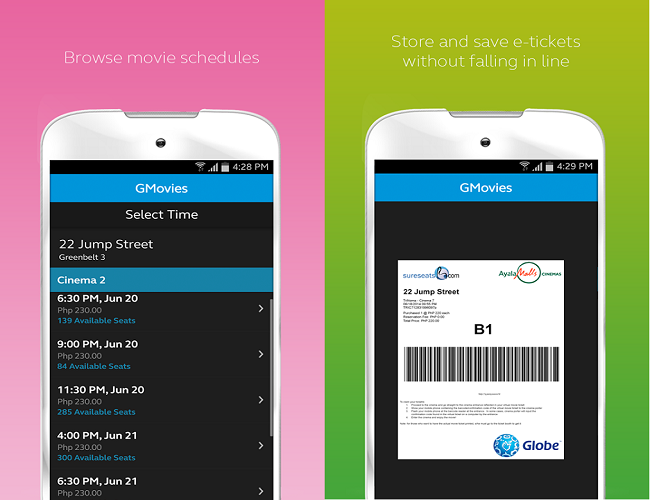 Gmovies is a mobile app from Globe Telecom that helps users book tickets without the hassle of queuing at cinemas. Movie goers can pay via their MasterCard or Visa credit cards, GCash, use MyRewards Charge, Promo Code, Ayala Malls’ MPass card or include it in their Globe postpaid bill. By using the mobile app, users can plan their movie date ahead and pay for it without using cash. But Gmovies offers users one more benefit which is perhaps its greatest selling point. 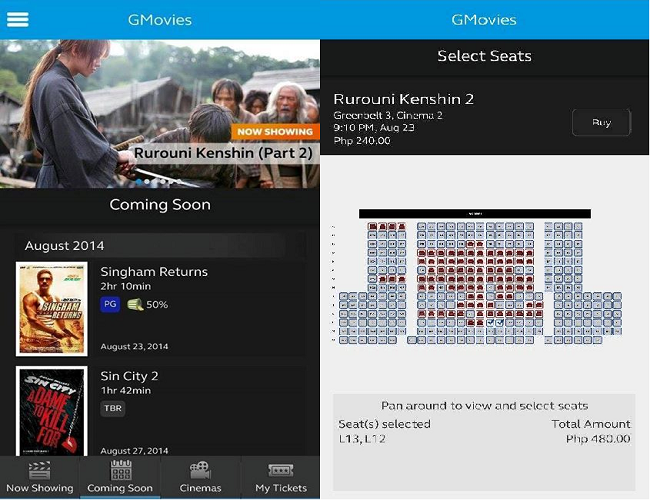 By using Gmovies, users can reserve the best seats in the cinema to ensure a more enjoyable viewing experience. 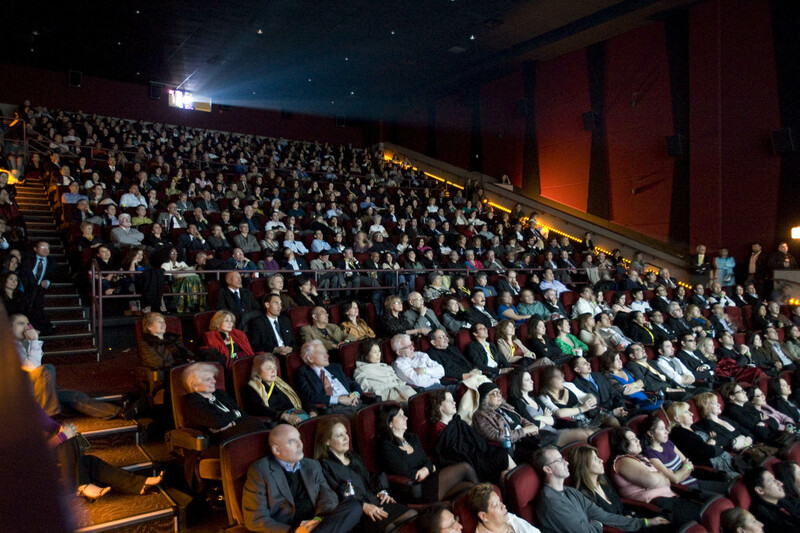 In addition to buying tickets and securing your preferred seats in the cinema, Gmovies also let users rate and share movies with their friends. You can become an instant movie critic, aka GReeler, and post your movie reviews, musing and rants to the Gmovies community. Blink, a video-on-demand streaming service, is another way to watch movies and TV shows on the go. Blink boasts a huge library of Hollywood movies, TV series as well as sports events. Users can choose from more than 300 movies, enjoy up to 2000 hours of TV shows and livestream via 5 channels on their smartphone or tablet. The Blink official site enumerates a few simple steps to get started with the app. Sign up, choose a movie or TV show, pay and download the app over at iTunes and the Google Play Store to start watching. Payment options include credit card or Paypal, Blink prepaid cards, Globe Gcash and e-pins from Smart, Sun Cellular and Talk n Text. Rates start at PHP60.00 for catalog titles, PHP99.00 for newer films that are available a month after its showing date and PHP250 per month (or PHP9.00 per day) for TV shows. Purchased movies expire after 48 hours after watching and will stay in a user’s library for a week. But you can watch the TV shows as often as you like within the one month subscription period. With these 2 apps, you can be an experienced movie viewer in no time!